Well this year has started off pretty awesome and it’s only going to get better! #1, I remembered to add cabbage to the pozole, which was HUGE! Let’s just say I got a lot of grief the last time I made pozole. All my Mexican friends were saying “But there’s no cabbage”, “It’s not pozole without cabbage!” Ya…ya, I know. So I had the produce guy cut me a small chunk of cabbage, just for this smoky stew. And they were right…it was perfection! 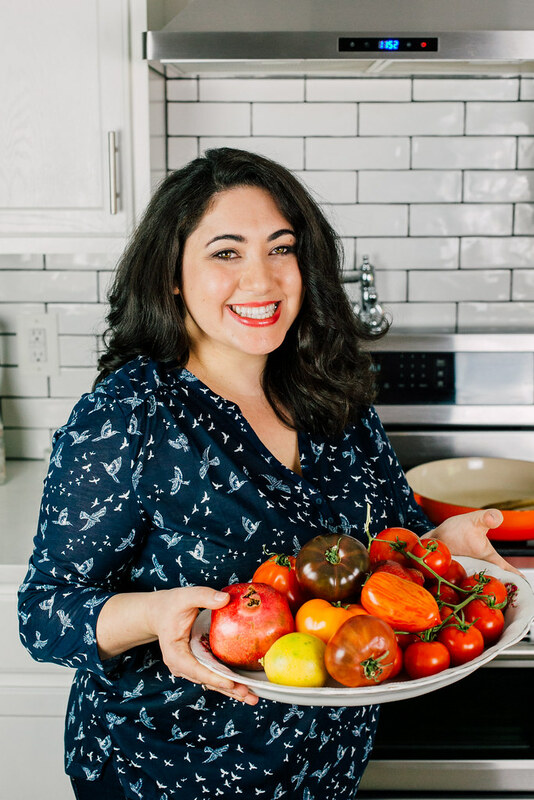 A few other fun things happening in the Ferraro house… #2, I got a job promotion, which is pretty cool because I really needed to prove to myself that I wasn’t going to “bag groceries” for the rest of my life. Which isn’t a bad thing at all, I just needed a personal challenge! I don’t normally talk about “personal” things on here since I want to let the food shine, however with more working hours, this just means I need to schedule my cooking accordingly. I’m already thinking about what to make for Chinese New Year in February…any suggestions?? And #3, this June, Joe and I will be celebrating our 10 year wedding anniversary!! Time flies when you’re having fun! The planning stages are just beginning, but we decided to bring it all home to Hawaii, where we both met! It just feels right to have my family and our Hawaii friends there, celebrating together. We wanted to be near people we loved, in a special place, calming and spiritual and it just feels right. More on the party planning as we go along…but expect to see a lot of Hawaii pictures this summer! 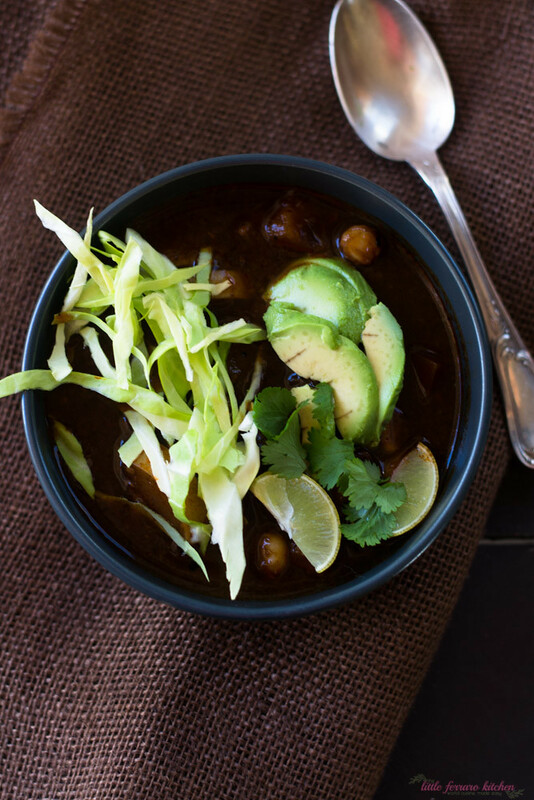 Now let’s chat about this glorious vegetarian red pozole. 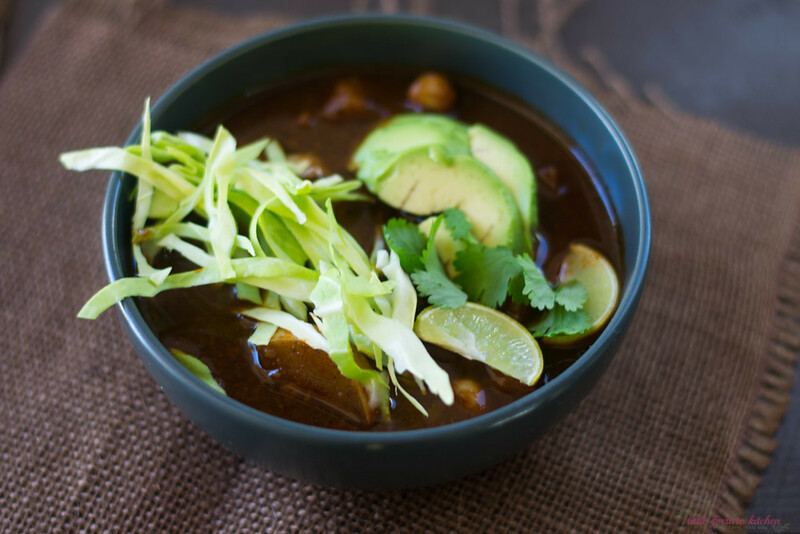 Basically the same as when I made the more traditional pork pozole, except I omitted the meat and added beans and any vegetables I had on hand. The deep red smoky broth is all thanks to dried hatch chiles that I was gifted with from Melissa’s Produce. 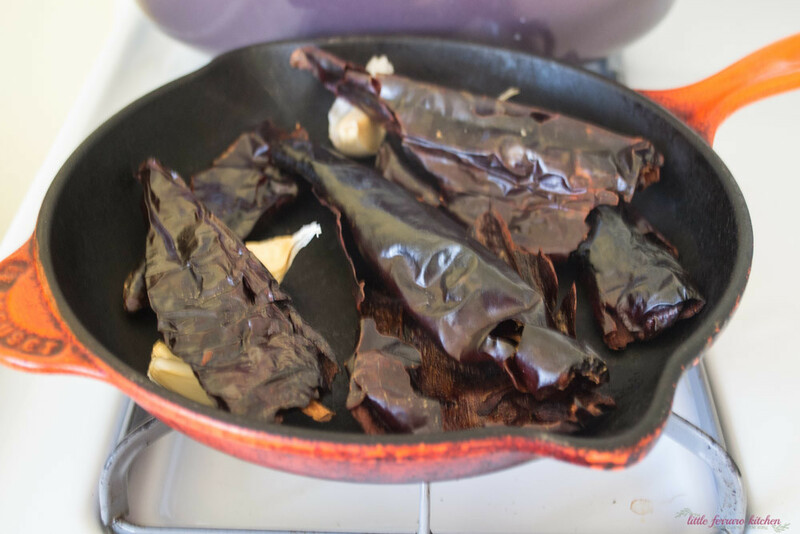 Of course, if you can’t find dried hatch chiles, guajillo and ancho are just as delicious! My only tip is to REMOVE the seeds! Those things are hella-hot! Top as you wish, but the cool and crunchy cabbage is more than necessary. It cuts the smokiness of the broth and offers a nice cool bite. Same idea with sliced radishes. I didn’t have those eon hand this time, but if you do, please throw those on top. 1) Start by removing all the seeds and stems from the dried chiles. Add chiles and garlic cloves to a dry pan on medium heat and toast for 1-2 minutes, but make sure not to burn. The garlic should get lightly browned on the outside. 2) When chiles are toasted, add them to a bowl of cool water and allow to steep for about 20 minutes. 3) Meanwhile, bring a large soup pot to medium heat and drizzle with olive oil and add chopped vegetables (butternut squash and zucchini). Season with salt and pepper and toss around a bit to coat with olive oil. 4) While vegetables are slowly cooking, make the chile sauce for the broth. In a food processor, add the soaked dried chiles, 1/2 red onion, toasted garlic cloves (skins removed), few sprigs of fresh oregano, cilantro, salt and pepper and a drizzle of olive oil. 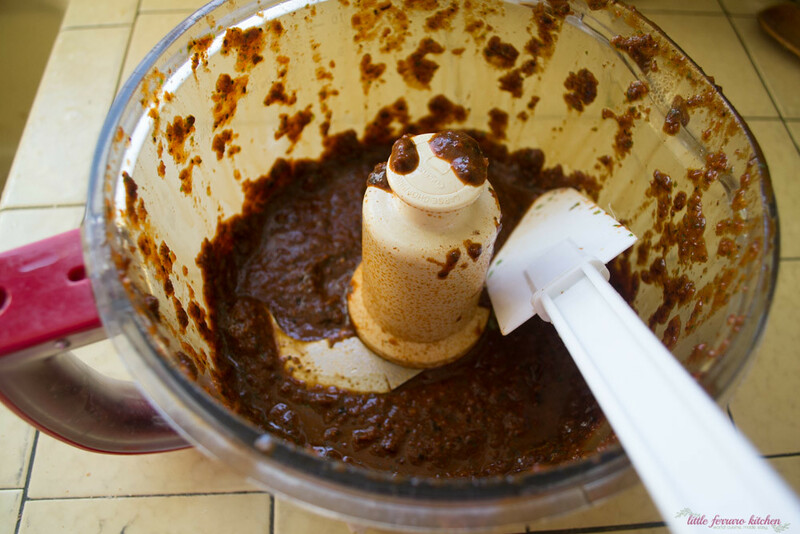 Blend together and slowly add the soaking water (that the chiles were in) to thin out consistency, up t0 1/2 cup. Blend until smooth. 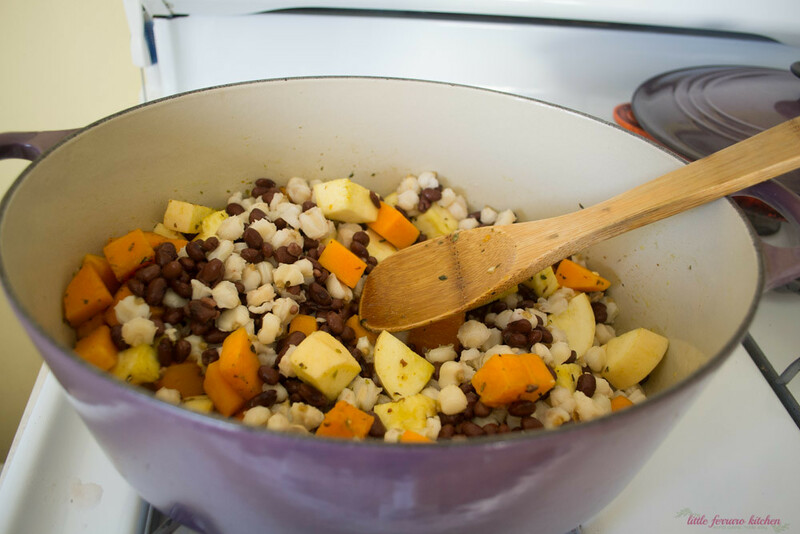 5) Next, add the hominy and black beans to the vegetables in the pot. Add 6-8 cups of vegetable stock or water with vegetable bouillon. Add the chile sauce and gently stir everything around. 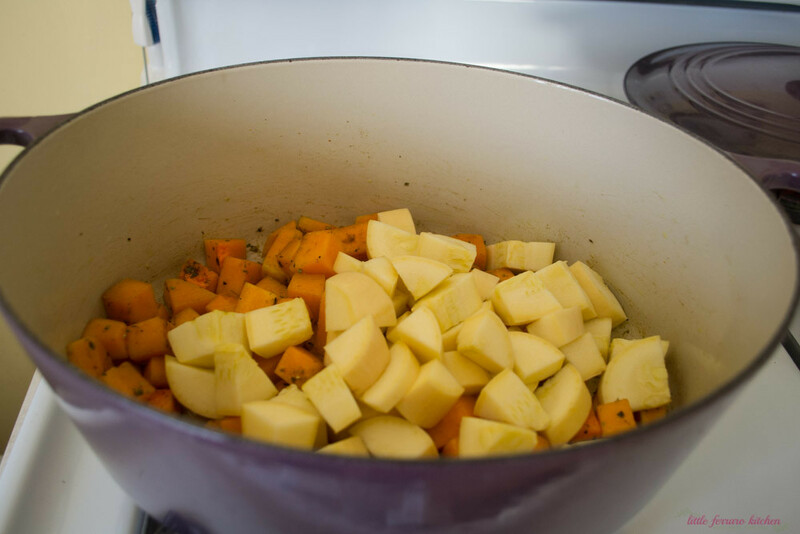 6) Cover pot slightly and bring to a boil, then reduce heat to low-medium and cook until butternut squash is tender, about 30 minutes. Taste for seasoning. 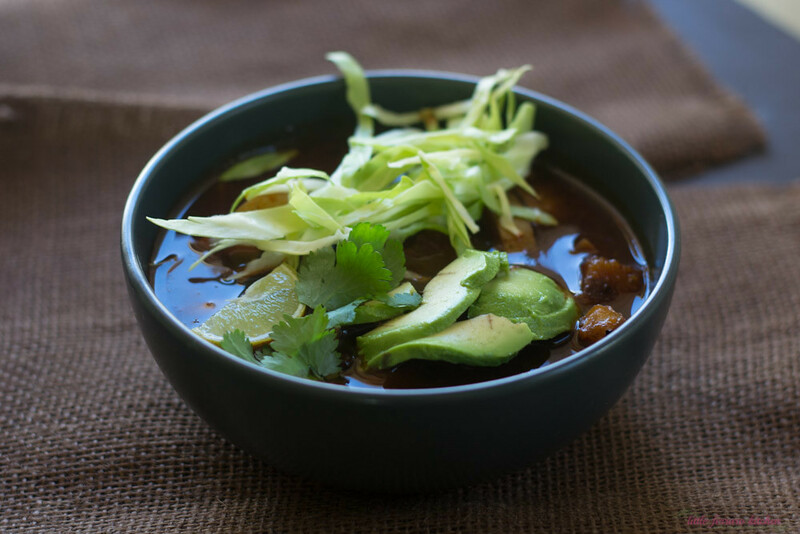 7) Ladle soup in bowls and top with sliced cabbage and avocado and lime wedges. Start by removing all the seeds and stems from the dried chiles. Add chiles and garlic cloves to a dry pan on medium heat and toast for 1-2 minutes, but make sure not to burn. The garlic should get lightly browned on the outside. 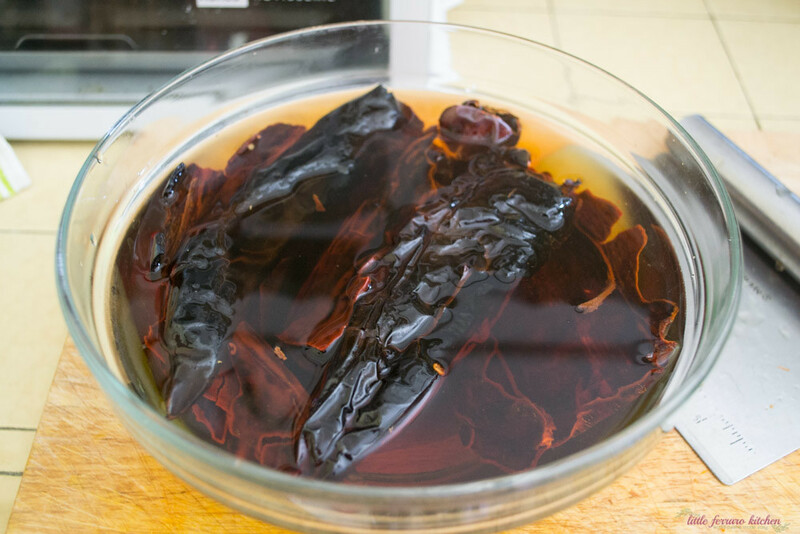 When chiles are toasted, add them to a bowl of cool water and allow to steep for about 20 minutes. Meanwhile, bring a large soup pot to medium heat and drizzle with olive oil and add chopped vegetables (butternut squash and zucchini). Season with salt and pepper and toss around a bit to coat with olive oil. While vegetables are slowly cooking, make the chile sauce for the broth. In a food processor, add the soaked dried chiles, 1/2 red onion, toasted garlic cloves (skins removed), few sprigs of fresh oregano, cilantro, salt and pepper and a drizzle of olive oil. Blend together and slowly add the soaking water (that the chiles were in) to thin out consistency, up t0 1/2 cup. Blend until smooth. Next, add the hominy and black beans to the vegetables in the pot. 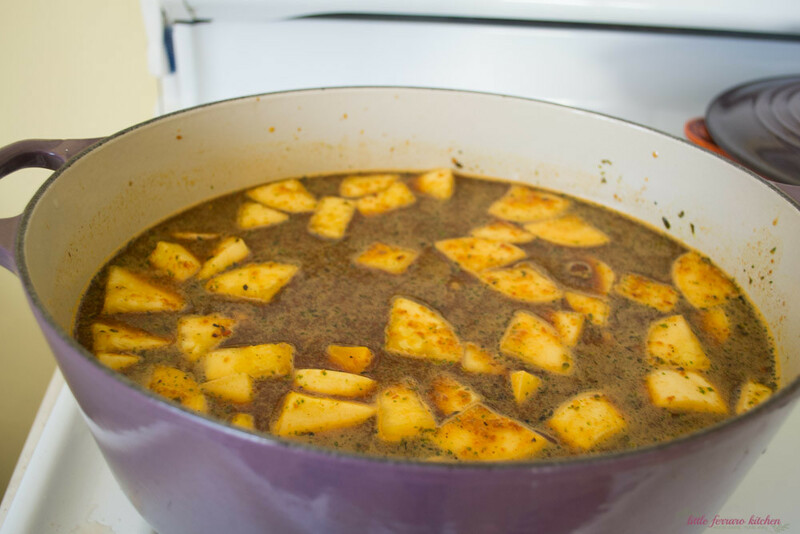 Add 6-8 cups of vegetable stock or water with vegetable bouillon. Add the chile sauce and gently stir everything around. Cover pot slightly and bring to a boil, then reduce heat to low-medium and cook until butternut squash is tender, about 30 minutes. Taste for seasoning. Ladle soup in bowls and top with sliced cabbage and avocado and lime wedges. This looks so good! Just what I need in this cold weather.